On the cards: "Why a deck of cards?" The book is instructional. 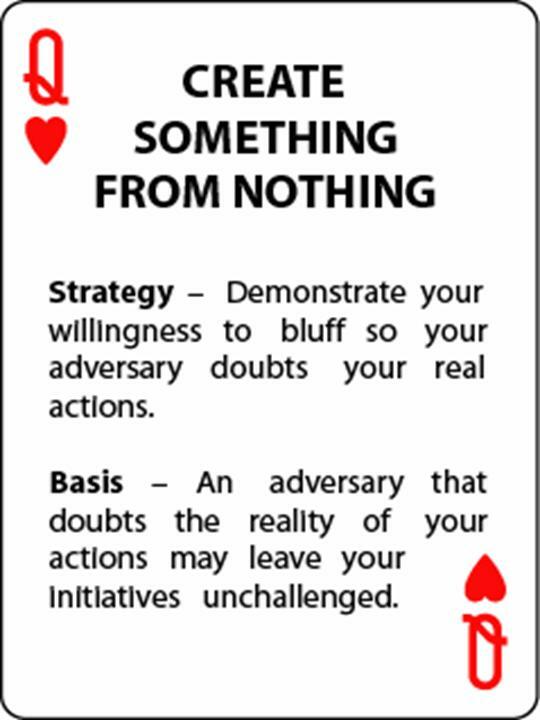 The cards provide a tool to put what you learn in the book into action. Since the strategic thought process in non-linear, the cards further benefit from you ability to arrange them in any way you choose. 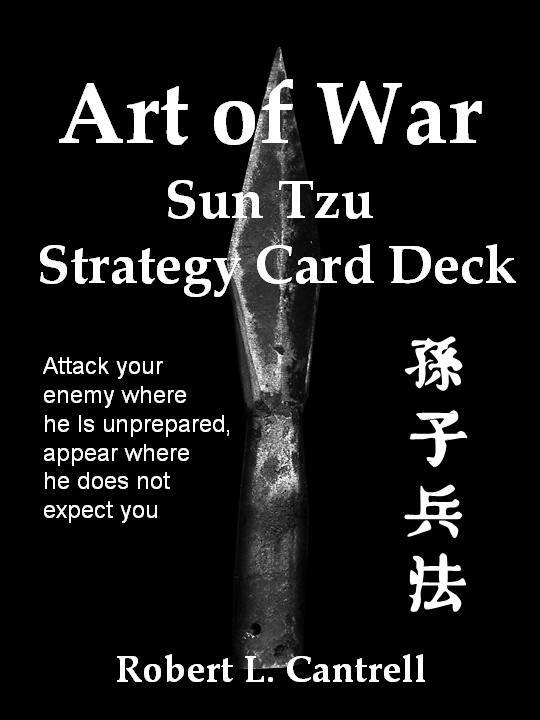 The Art of War: Sun Tzu Strategy Card Deck is a serious planning tool that uses the playing card format to enhance its usefulness and appeal. The cards comprehensively cover all the competitive principles that appear, in one form or another, in an competition. Instructors from the National Defense University are using the cards as a serious teaching tool for some of the best and the brightest senior officers in all the military services to explore such issues as force structure, Crisis Action Planning (CAP) processes, and anti-terrorism. Other institution, to include at least one group within the CIA, have followed suit. The Art of War: Sun Tzu Strategy Card Deck presents, in about 1,600 words, information of a nature that most authors will spend fifty to one-hundred thousand words to describe. This means those 1,600 words are very precise. Will you be producing electronic versions? I have been reluctant to do so because I have so many people comment how much they like to "hold a strategy in their hand." Somehow the idea on each card seems more tangible that way. I did, however, finally purchase my own iPad. The tablet environment may work, because there is enough space to lay cards - virtual cards - side by side just like you would with a physical deck. The real power of these strategies is as combinations, easy to do with physical cards, tough on a smart phone. So stay tuned. On the cards: "What's in it for me?" 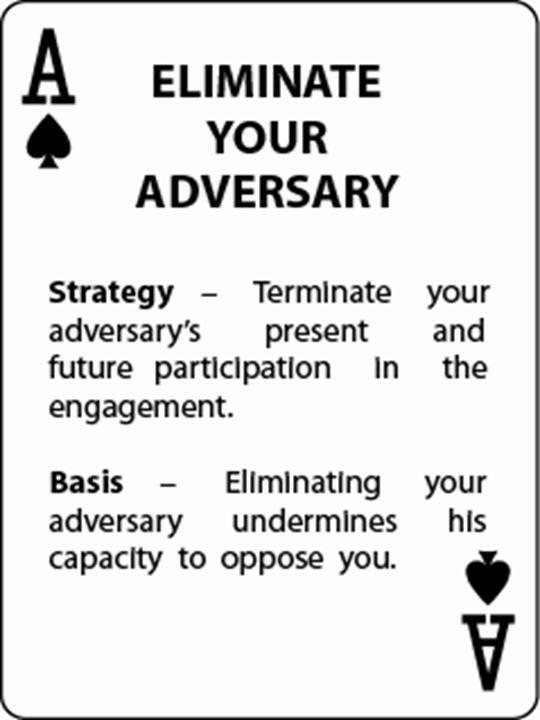 The "Art of War: Sun Tzu Strategy Card Deck" increases the menu of available strategic options that stay at the top of your mind. You can study it, review it, even "spar" with it like a martial artist*, so you start to recollect strategies when you need them without taking too much time to think about it. Your capacity to recollect a wide variety of strategies fast and effectively gives you a tremendous edge in competition since, if you can assess - act - decide a step ahead of your competitor, he will likely make mistakes that allow you to win. *Strategy Sparing - You and an opponent each draw 5 cards. Your opponent places a card on the table that describes a strategy, then draws a new card. From the 5 cards in your hand, you place a card on top of his that counteracts his strategy. Draw a card from the deck and now you place a strategy card down end he counteracts it. Just like in physical martial arts sparing, you do not necessarily have correct and incorrect responses, but you may have responses better suited than others. The important thing is to see the combinations so they start to feel natural and stay at the top of your mind. On the book: "What's in it for me?" 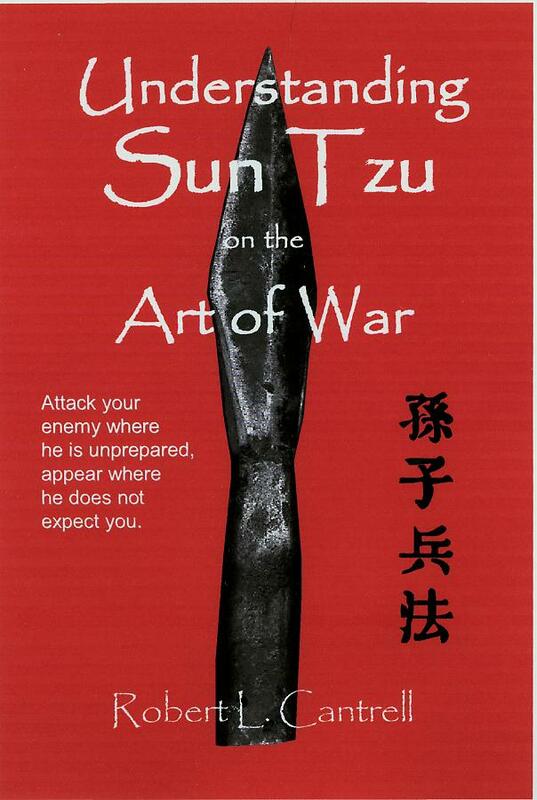 Understanding Sun Tzu on the Art of War put Sun Tzu's ideas into a context that makes them useful. What does this mean? It means you will own a process for identifying how to compete and win in ways that are not obvious to most people. Effective ways to compete that are not obvious tend to draw less opposition, meaning you obtain the most success with the least amount of effort. Effort saved that you might otherwise have used to obtain your success, stays available to use for additional success. On the cards: "Is there a game associated with the cards?" Yes. There are games associated with the cards that are listed on www.artofwarcards.com. On the book and cards: "Do I need to buy both?" No. They are completely independent products. However, they do complement each other. Each product is written to elevate the experience and lessons of the other. The cards are particularly useful in addressing strategy problems of achieving the most benefit with the least risk. The book is particularly useful in addressing strategy contradictions such as "how to be present on the battlefield where I can strike my enemy yet be absent from the battlefield so he cannot strike me." On the book: "Does Understanding Sun Tzu on the Art of War contain a complete translation of the Art of War?" Yes. And in keeping with the title of the book, it arguably contains the clearest translation of Sun Tzu’s Art of War on the market. Understanding Sun Tzu on the Art of War: While heeding the merit of my council, avail yourself also to any helpful circumstances that give you advantages beyond the ordinary conditions. Sawyer Translation: After estimating the advantages in accord with what you have heard, put it into effect with strategic power supplemented by field tactics that respond to external factors. Ames Translation: Having heard what can be gained from my assessments, shape a strategic advantage from them to strengthen our position. Cleary Translation: Assess the advantages in taking advice, then structure your forces accordingly, to supplement extraordinary tactics. Griffith Translation: Having paid heed to the advantages of my plans, the general must create situations which will contribute to their accomplishment. Denma Translation: Having appraised the advantages, heed them. Then make them into shih to aid with the external. As a retired military intelligence professional and conflict theorist, I must say this is the best interpretation of Sun Tzu’s classic work I have read. The author focuses on the meanings behind this ancient Chinese war philosopher’s writings. He puts them into a modern context, making them easy to understand. Apparently the Department of Defense agrees with me on this, since they have selected Mr. Cantrell’s book as a text for the National War College in Washington DC. This is a must read for all military officers and business leaders. It rated a perfect five hearts. On the book: "Who represents your book?" The book is represented by Atchity Editorial/Entertainment International, www.aeionline.com, and is distributed to the trade by National Book Networks. On the book: "I already have a copy of Sun Tzu. Why should I also buy yours?" Did you understand it? If not, that's the first reason. And if you did, there's a depth to Understanding Sun Tzu on the Art of War you will not find in other Sun Tzu books - at least according to my audience, but also for substantiated reasons below. The above method of understanding systems in context with other systems is supported in mathematics by Gödel's Proof which definitively shows that no system can be described in context with itself. The way most books on Sun Tzu explain Sun Tzu in context with itself is equivalent, though less obvious, than the difficulty a person would have explaining words without explaining letters that make up words and sentences derived from words. You do not need to know Gödel's Proof to appreciate this, anymore than you need to know the intricacies of a BMW engine to enjoy driving it, however as an author, I have been delighted to have some mathematical types pick up on this.